The first assignment of the Common Pastures Farmer-to-Farmer Program was to help Malians make better use of their land, which could not reliably sustain livestock due to a lack of quality forage. 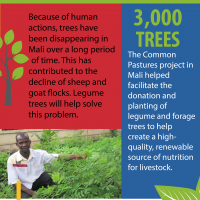 Planting legume trees will not only help to create a renewable source of high protein nutrition for sheep and goat flocks, it will also help stabilize and enrich the soil. This is part two of a four-part infographic series that shares information on the assignments we undertook and the results we achieved in the first year.